The biannual report says Cambodia’s tourism and agriculture sectors have fallen behind the bustling construction sector in the first half of this year and are now the third- and fourth-largest contributors to the country’s gross domestic product (GDP), respectively. The World Bank attributes the deceleration of the tourism sector to political turmoil in Thailand, while the slowdown in agriculture is due to the global reduction in the price of crops. “[The] challenge is to stimulate agricultural and tourism growth,” says the report, which predicts GDP growth of 7.2 percent in 2014, 7.5 percent in 2015 and 7.2 percent in 2016. To sustain growth in the tourism sector, Cambodia needs to offer more joint travel packages and diversify the options available to tourists, Sodeth Ly, a World Bank country economist, said during the launch of the report at the bank’s Phnom Penh office. “We need to diversify our tourism products for people to come again and again. This includes creating more ecotourism. 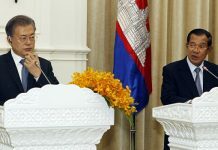 Eighty percent of tourists go to Thailand for the coastal regions, while only 1.4 percent come to Cambodia for the coastal regions,” he said. The report says half of Cambodia’s arrivals are by land and that roads should be better maintained and linked with tourism sites and major border crossings. 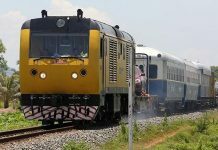 “Improved road transportation …would help promote diversification of tourist destinations beyond the Angkor Archaeological Park to include beach areas and ecotourism,” it says. As for Cambodia’s burgeoning construction sector, Enrique Aldaz-Carroll, the World Bank’s senior country economist, stressed that the bank has not seen signs of a bubble, though he said the sector must be monitored. “Construction is cyclical, so we need to make sure a bubble doesn’t happen,” he said, adding that the sector expanded by 15 percent last year and would likely grow at an even faster clip this year. 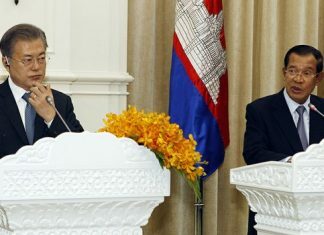 The report also recommends that Cambodia improve its investment climate by reducing the cost of electricity, cutting political red tape and reducing corruption. “The key constraints for firms continue to be electricity cost and access, informal payments and uncompetitive practices,” the report says. Julian Clarke, the World Bank’s senior trade economist, said firms are paying less in bribes to the government than in years past, but that automation would help reduce graft even further.